The word ‘multi-purpose' is bliss to a busy woman's ears, particularly when it comes to the potential contents of her handbag. Be it mums with wet wipes, spare nappy and snacks or the business exec with her Blackberry, mascara and water, all women could do with lightening the load a little when travelling from A to B... school to football practice... the office to that meeting on the other side of town. Beyond the mobile phone, what's the most common item found in our handbags ladies? Balms, moisturisers, hand creams - stuff that revives our skin from the demands of leading a full life in the 21st century. But rather than carrying around a cosmetic counter full of lotions and potions to keep you beautiful perhaps you consider just the one. 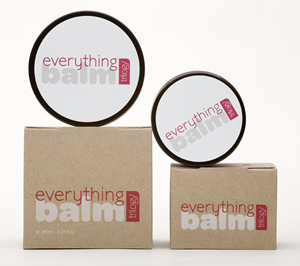 Some of the best natural and organic multi-purpose balms these days can be used for ... well just about everything. Make up remover, lip balm, hand cream, heel-softener, body lotion, moisturiser and... lubricant? (well the new YES natural oil-based lubricant does double as a body moisturiser!). Everything Balm by Trilogy - with certified organic rose hip oil as its active ingredient is rich in Omega 3 and 6, natural super-emollients, vitamins and antioxidants. A little goes a long way. Can be used to soothe dry skin, as a massage oil, lip conditioner, and moisturising baby. The rose hip helps to minimise scarring, improve skin elasticity and reduce the signs of premature ageing. Fragrance Free Baby Balm by Balm Balm - suitable for all skin types (particularly sensitive, hence the baby feature) this shea butter based balm is good to apply to cheeks, lips, neck, hands, arms, legs and feet - anywhere that's feeling a little dry on you or your little one. Calendula Balm by Essential Care - the Green Beauty Bible says this balm is a "100% organic pot of wonder". Ideal for cracked cuticles, chapped skin and psoriasis this balm utilizes the medicinal healing properties of, you guessed it, the marigold flower. A great balm to use in the dryer winter months and on the kids scraps and grazes. Facial Cleanser by Spiezia - though techinically not a balm this award-winning-beauty-buy is a make up remover, moisturizer and cleanser in one. You could also apply to lips for a little glossy moisture if need be.